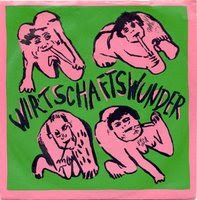 Die Wirtschaftswunder were a unique German-Italo group featuring the crazed vocal work of the Sicilian Angelo Galizia. His backing group was the Czech songwriter Tom Dokoupil (Siluetes 61, Die Partei, Die Radierer), Canadian Mark Pfurtschneller on synths, and the German percussionist Jürgen Beuth (also the songwriter with Die Radierer). Great stress was placed on the group's origins in the small town of Limburg, the capital of the district Limburg-Weilburg in the west of Hesse. 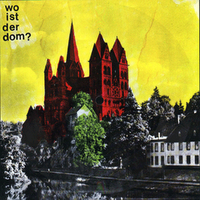 Recorded in Dokoupil's small home studio, the 1980 C-50 cassette sampler titled Non Dom, a Wirtschaftswunder, Die Radierer, and Siluetes 61 triple header (available via mail order and at early gigs), all groups from in and around Limburg, featured a cover drawn from the 600 year old Lahn Bridge overlooking the Limburger Dom cathedral. Die Wirtschaftswunder's big break came when they landed a slot playing alongside Fehlfarben and Östro 430 as part of a series of gigs organised at Düsseldorf's legendary Ratinger Hof venue in July, 1980. 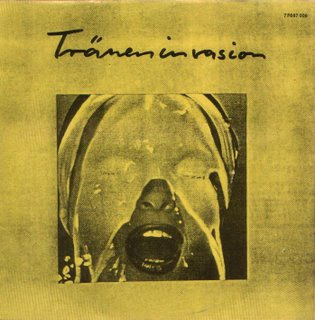 Frank Fenstermacher witnessed the concert and soon flew to Limburg with his fellow label and Der Plan colleague Kurt Dahlke to arrange the group's first EP release on Warning Records, aka Ata Tak, in 1980. It featured two of their most punk inspired tracks Allein and Don't Listen. By this time the Non Dom cassette sampler had been quietly causing a stir due to the promotion and distribution of Alfred Hilsberg's Rip Off shop, and its mail order catalogue service. 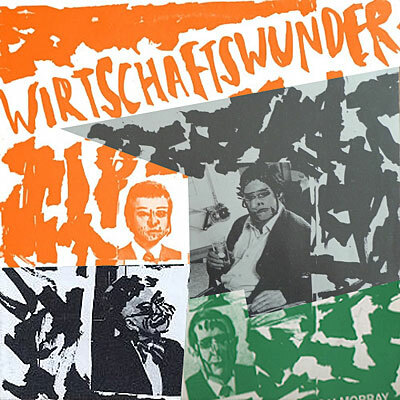 Hilsberg had plans to document the emerging Limburg post-punk scene, and so brought Wirtschaftswunder over from Ata Tak to his ZickZack label based in Hamburg. 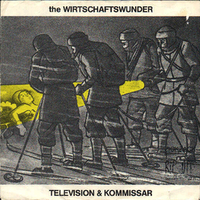 The subsequent Die Limburger Pest 3 x 7" pack grouped Wirtschaftswunder's next single, the Television & Kommissar/ Ein Meadchen auf der Strasse 7", together with Die Radierer's Angriff Auf's Schlaraffenland and the one-sided flexi Wo Ist Der Dom? by Siluettes 61, a creative Tom Dokoupil side project, once again making use of the iconography of his town's cathedral with both its sleeve and the song's subject matter. 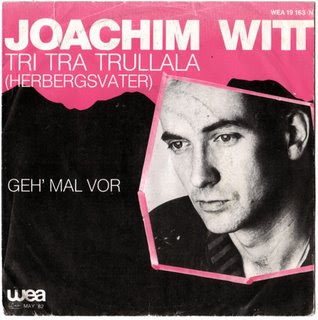 Evidently, the nutty detective piece on the b-side to Wirtshaftswunder's Television single, Der Kommissar, takes its title from the German TV crime series of the same name, and goes so far as to re-work Herbert Jarczyk's jazzy title score from the 60's, even sampling voice extracts from an episode appropriately named Tod eines Hippiemädchens. This actually became an underground hit, lingering in the Sounds indie charts for several months, and for good reason. I understand Angelo Galizia's vocals were often incomprehensible, his Canadian origins more often than not producing a sort of German babble speak. This furthered a real sense of Dadaism already lending itself to the cut-up text and artwork, in conjunction with the music's left of centre stance. 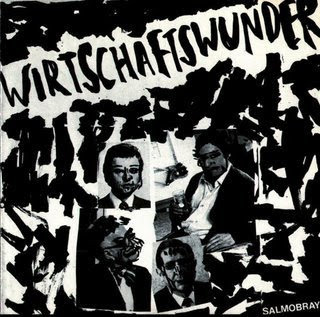 Sound-wise, Wirtschaftswunder had a Dadaist/ Doktor Caligari combined vibe, reminiscent of Cardiacs' warped seaside-fairground sound in Britain, that was being practiced and recorded to tape around the same time in the early 1980s. During this spell, Wirtschaftswunder, and several other experimental NDW groups and artists, were being parodied by Xao Seffcheque on the infamous Sehr Gut Kommt Sehr Gut prank compilation, which can be found as part of WFMU's Audio Hoaxes and Urban Legends post. After a brief collaboration with Wolfgang Luthe for a punk fanzine flexi-disc, the group's major label debut landed on Polydor, worth picking up, if only for the excellent DAF inspired number they titled Kopfgeldjäger ('Head Money Hunter' [sic]). However, there was a slight sense that the freewheeling punk spirit of the earlier work was slowly starting to be fizzled out by Polydor. Wirtschaftswunder's name suggested a wry commentary on the Soziate Marktwirtschaft, and how its aims for a 'socially conscious free market' never actually lived up to the so-called 'miracle' that the Wirtschaftswunder created for the post-war German economy. I know many groups at the time supported the likes of RW Fassbinder's film work, and his examinations into the kind of cultural hollowness at the heart of the German economic miracle. The Mondpalast cinema in Lindburg was an important meeting place for the local scene's art students, especially the venue's bar, which often featured live gigs from politically charged groups in the area, Nylon Euter and Korpus Kristi among them. Wirtschaftswunder attempted to rescue some of their experimental edge back by releasing the eclectic soundtrack to Gabor Altorjay's Tscherwonez film through Polydor. Here is Die Flucht from that LP, the rest of which seems to travel musically across the globe. Tscherwonez was a black and white Super-16 film from 1982 that featured both Tom Dokoupil and Angelo Galizia in major roles. The movie's style also happened to anticipate some of the Soviet aesthetics creeping back in to experimental German film of the late 80s. But really, as for the Wirtschaftswunder sound, by 1984's predictable Pop Adenauer LP, and the slick mid 80s white-boy funk of its accompanying Pizza single, Wirtschaftswunder's edge was finely being chiseled off and polished up for the New Pop era, that dubious Warhol inspired post-punk theory about going for gold and beating the pop charts at its own game. But that's another story altogether. I would very much like to hear from anyone willing to offer sound clips of Tom Dokoupil's cassette release for ZickZack, or the record he produced later on under the name Quick Culture. For a far more in depth overview of the Limburg post-punk scene, please consult this wonderful essay published by the good people at Belchluft, which helped considerably with the latest revising of this post. You beat me on the Wirtschaftswunder post, but I will post Television soon. Thanks for the link to Xao's record! As i said I saw it in record shops but didn't buy it. The Tscherwonez song btw is called "Die Flucht". This film was shown on german television in 84, a story about soviet sailors and their adventures in Hamburg I think. If I remember it correctly Tscherwonez is a russian gold coin. Tom Dokoupil played a russian sailor looking for his brother in Hamburg, followed by the KGB. Thinking of this movie makes me think of "Die letzte Rache" by Rainer Kirberg with music by Der Plan and lots of funny decorations by Moritz Rrr. Maybe I should get this LP into the net? Offering a download link to Konrad Becker's music taps into some of the politics of info-streaming that Becker has highlighted over the years, particularly through his non-profit organisation Net Base, and its support for the right to flow information freely across the web. Questions on censorship still generate debate, and in relation to music downloads it's skyrocketed, particularly amongst industry types. Becker has never been concerned with music as business though. The Monotonprodukt moniker suggested the task at hand was partly to recontextualise the monotonous product symptomatic of the mainstream. Edinburgh's Fast Product pulled a similar stunt (Fast's Mutant Pop LP is at Post-Punk Junk). Label boss Bob Last and his 'interventions in any media' supplied its consumer with all sorts, mainly ravishingly designed LPs but, and here's the catch, in very limited editions. Monotonprodukt's approach went one step further, and was far more clinical and sophisticated, retaining a cold faceless Teutonicism as it went. Konrad Becker's main interest was converting metamathematischen strukturen into music. Each interdisciplinary program that bared the Monotonprodukt name existed via a new culture-synthetic medium, be it a concert/ installation, video, or cassette, and each would produce its material from arithmetic. Becker was his own 'subjective scientist' carrying out his electronic operations as part of an institute he founded and named Wissenschaftliche (Scientific) Sensation. Monotonprodukt dates back to 1979 with a cassette known simply as 01. Its tightly wound oxide-coated tape held by its cheap plastic case was merely another medium for this all-round multimedia artist/ writer to document and present his craft. Though situated in Vienna, a city steeped in Gothic-Romanticism preserving its history as it modernized, Konrad Becker just about showed up on the early NDW radar, his electronic work bearing similarities with other Germanic sound designers of the period such as Conrad Schnitzler, Harald Falkenhagen, Ralf & Florian etc. This is his debut LP, number two in the Monoton production line. It is the sound of him almost contemplating a forthcoming masterwork, or perhaps pondering a future mindset and head space in which people could allow for sonic repetitions to enter their living environments, as complimentary to their strange electronic netherworlds, like Orwell predicting helicopters would take off. Konrad Becker did not search for life's numerical answers alone. He often enlisted the help of musicians Eugenia Rochas and Albert 'Ali Krawalli' Griehmann, formerly of Austrian punks Chuzpe, and later on Daniël Leeflang/ DJ Dano. Becker himself guested on the self-produced Tausend Seen 12" by Dämmerattacke, New Wave minimalists from lower Austria, on the Panza-Platte label from 1982. After a second cassette (03 in line) titled Neujahrskonferenz 80/81, a split with sister project Wissenschaftliche Sensation (the Ich Weiß Nichts 7" (04) it produced can be heard in Real Audio here), there was the Gesellschaft für Wissenschaft & Volkstanz (Society for Science & Folk Dance) project, furthering his exploration of psychosomatics. According to Christian Höller, from the Lost and Found article (translated by Timothy Jones), Becker performed an 'eight-hour-long dismantling of the sound barrier... in the Virgil Chapel under Vienna's Stephansdom' in June 1981, an exploration into sonic art that sounds like the kind of installation work Disinformation produce today. As for this record, if DJ Food's Raiding The 20th Century, a plunderphonic compression of trends over time in electronic music, acted as the overground express journey through Words & Music, with Paul Morley your conductor/ host, then Monotonprodukt is its nightlong slow service soundtracking Morley's thought process in piecing together the connections between Alvin Lucier and 'Can't Get You Out Of My Head'. Like Lucier and Ryoji Ikeda after, Becker was interested in human perception in relation to the physical characteristics of sound. His greatest achievement was undoubtedly 1982's self-released double-album, finely tweeked and reissued 20 years later as the definitive Monotonprodukt 07 20y++ CD on Montreal's Oral label, its re-release perhaps inspired by its inclusion in The Wire's 100 Records That Set The World On Fire (When No One Was Listening), published in 1998. Becker's electroacoustic conversions from roots, powers and periods, pi factor, Fibonacci series, fig tree numbers, and 'magic squares', was a fine precusor to the digitalia and minutiae of today's laptop processed sound. 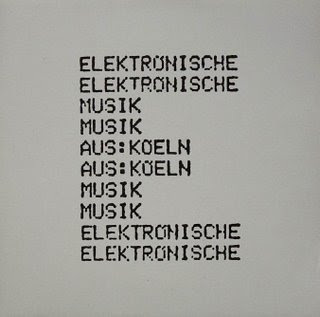 Due to its minimalist/structuralist sleeve design and trancelike electronic repetitions, it went one further than predicting techno as Kraftwerk had done beforehand. In hindsight, its calculations for the post-techno habits of the Mego label were spot on. 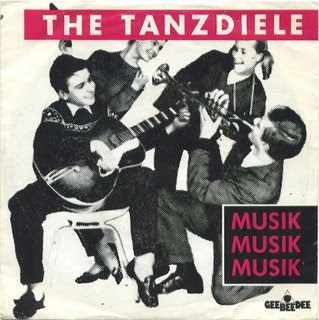 Led by comedian/ author/ actor Peter 'Piet' Klocke, The Tandiele (The Dance Hall) was Klocke's studio project from the Ruhr district of Germany, Essen, before they had to change their name, apparently due to legal reasons, to Die Tanziebe (The Dance Thieves). With Tanziebe, they scaled down mainly to a three-piece group (Klocke, Norbert Woike, and Achim Grebien), removing the electronic element, and releasing a live album, following the success of Tanzdiele's debut Folgt den Führern! (Follow The Leader!) LP for GeeBeeDee back in 1982. This is the one single from that record. Munich's Gomma label brought it back to light in 2002, by including the A side on the first Teutonic Disaster compilation, in amongst other lost relics of the era such as that excellent Am Abend Im Land Der Träume track by 50 Tabletten. The New Wave project known as Carmen was also featured on the comp, which Piet Klocke happened to write for. Other pre-Tanzdiele groups for Klocke were Kamikaze Orkester and Gesundes Volksempfinden, the latter producing 1981's half decent self-titled record for the Ahorn label. Klocke went on compose film music, soundtracking several Richard Claus films, and play small acting roles for film and German television, including his part in the comedy program Hip Hop für Angestellte. Is his comedy any good? Musically, Klocke's Tanzdiele project was so great, I've upped it at 256kbps in celebration. In the early eighties, it seemed Germanic groups produced a lot of what is now called 'minimal-synth' or minimal-wave' music. And with every new movement there are precursors. West Germany happened to have a native tradition of visionary electronics to fall back on, from Stockhausen through to Czukay up to Kraftwerk, pioneers, I should add, who had very little in common with these two teenage pranksters. 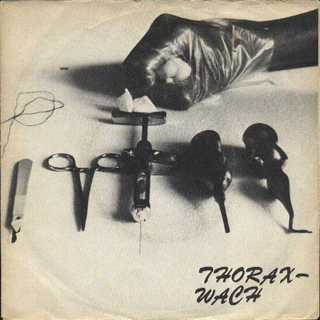 Yet Thorax-Wach happened to represent one of hundreds of early groups documenting, without knowing it, a major turning point in the history of electronic music. For better or worse, technology quickly fell into the hands of the unacademic, untutored, but inquisitive new generation of kids, raised on the excitement punk generated amongst the youth, especially in its DIY opportunities. Vintage synths were handed down somewhere along the line, or cheaper alternatives were picked up flogged off the backs of lorries. A further shift in dynamics from what came before was how electronics became the tool to reflect a sense of urgency and panic out of the sheer pace of life and technological growth racing towards the eighties, coupled with punk's fearsome annihilation of the hippy movement altogether. The kind of major label utopian electronica of the New Age (what happened to Ash Ra Temple for instance), a 'nostalgia for the future' David Toop once talked about, was completely at odds with the street level rawness and anti-spiritual vibe of the German New Wave scene, shoving its way out from punk's failings. These failings seemed to resonate with German art school students the most. One thing new German groups certainly didn't want to do was emulate the Chuck Berry Americana of the Ramones. Kraftwerk had already made famous their unflinching interpretation of West Berlin as a grey, cold, and decadently fashionable city of the future, and one that Lou Reed, Nick Cave, Steven Stapleton, Brian Eno, Iggy Pop, David Bowie etc. would all flock to or visit at some point. Minimal-synth took this deliberately dry and detached approach back into the underground, from where it once originated, and presented a far more dark and dystopian view of both popular culture and the socio-political climate of the times, and with a knowing smirk. Punk's simple liberating conceptions reached all neighbourhoods, even the German ones. 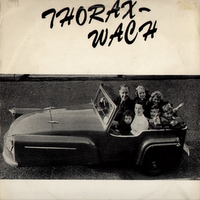 From the small northern town of Göttingen, which also produced the New Wave groups Katastrophentheorie and Der Gegenschlag, came perhaps the most prolific duo from that area, Thorax-Wach. They produced only pure 2-track no nonsense DIY, with two Korg MS-20's and a microphone. Frank Dieckmann and Olaf Krämer self-released their first record on their own label creation named Schnellschnitt, in early 1980. A demented LP clocking in at a grand total of 11 minutes. It was titled Kaum Erdacht Schon Mode, which translates as something like 'only just thought-out, already fashionable' (I think). I much prefer its comical sleeve, an old photo of a large family crammed into a 3-wheeler, over the 7" and its imagery of doctor's apparatus. The cover to this 7" has got that stuffy 80s Gothic edge that was never a place that I discovered this music from, and by 1981, their C30 tape reached new creepy heights with songs about bodily functions, the elderly, eating children, and famous serial killers that were shocking the German nation at the time. 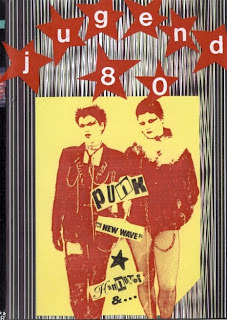 Still, it's with this earlier single, co-distributed in accordance with Alfred Hilsberg's Rip Off shop, that is the duo's most finely inspected dissection of the commercial structure and instrumentation of early New Wave music. The duo relocated to Berlin, working by day in the Zensor record shop, and by night, running amok amongst the agile underground Berlin scene. Their Der Moderne Luftkampft side project featured on the live at the S036 compilation Licht & Schatten. Olaf Krämer went on to form Die Goldenen Vampire, Germany's answer to The Cramps, whilst Frank Dieckmann settled for becoming a teacher. 'Art damaged electronicus' and 'a mildly Shaggs-ian Kraftwerk' were some of the more creative descriptions of the group's sound when I Googled. There's certainly some wonderful electronic experimentation going on here, which made me wonder what future generations hold for hands-on electronic sound manipulation? A side issue, but see what you think of The Blue Man Group's new range of musical toys, and their flash equipment soon to be on the market already pre-circuit bent. Now is the time to post an NDW party anthem (no, we're not talking Falco here). This is the Italian 12" version (Ariston Music) of the 'Grund und Ordnung' single by Weltschmertz, although I've had to steal both tracks from the 1982 LP, because I've yet to locate a copy of the 12" single with a reasonable price tag. The 'Grund und Ordnung' 7" features 'Astronaut' on the flip instead of 'Gala der Stars', and, though it's still better than the rather dated New Romantic-ish 'Sehnsucht aus Beton'/ 'Steinzeit' 45 (both tracks also on the LP), it's the 12" version of 'Grund und Ordnung' that's the one to get. I highly doubt any DJ's are playing this one out these days! Weltschmertz were a trio comprised of Barbara Schewe, Clemens Clemenzone, and Xaver Aahorn. The scan above is from the LP on Achim Reichel's Ahorn label, just to confuse matters, and there's also a Metronome Italian pressing (looks like they had the odd fan or two in Italy). It's a silly album, and well worth getting if, like me, you're having trouble finding the 12" single version. 'Grund und Ordnung' translates directly as 'Reason and Order', and the bizarre name-dropping b-side seems to have no logic or end in sight. Shameless fun. Definitely Giorbino's greatest single. 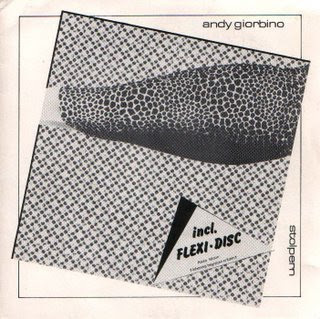 Andy Giorbino was a major player in the early 1980's Hamburg avant-garde scene and a fine contributor to Alfred Hilsberg's Zick Zack label (see the Grosse Freiheit single, below, for more ZickZack). This is number 032 in the label's back catalogue. Original copies came with a free 7" flexi-disc, featuring a live recording of Giorbino's performance group called Radio Moon, with the dancer Gitta Luckau, titled 'Lebendig Begraben in Köln' ('Buried Alive in Cologne'). My version is missing the additional flexi vinyl (maybe you had to send off for it? ), but not to worry, it's both the a-side and b-side of Stolpern that are most important here. 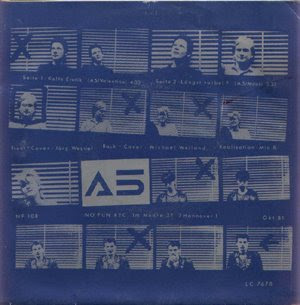 This is a real underground classic Neue Deutsche Welle single, just before the major labels caught on and capitalised on the New Wave sound, ultimately destroying the punk attitude and experimentation that made the movement so vital to begin with. All the more reason, then, to treasure works like this from the early 1980's period. Take a listen. Mannschreck was a New Wave project put together by Günther Mannschreck from his own Mannschreck Tonstudio in the greater Stuttgart area, about 200 km from Munich. Herman Kopp recorded his 1981 Aquaplaning In Venedig album in these studios, and the Stuttgart punk group F.A.K. also made use of the premises, releasing their self-titled debut EP on Günther's own Schreckschuss Records way back in 1981. 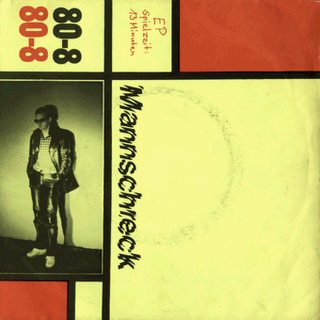 This, however, is the pre-Schreckschuss label DIY debut from Mannschreck, the 80-8 EP, from one year earlier. The four tracks alternate between Günther's, rather dry, vocals and Lilo Gasparitsch's more wild delivery. 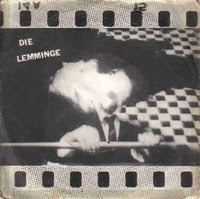 This 7" apparently didn't cut it with Alfred Hilsberg, whose scathing review in Sounds at the time may have encouraged the rawer and edgier sound of the second 'Beiträge zur Sinnespflege' 7". True, the two Günther vocal tunes 'Made In The USA' and 'Depression' are best forgotten about, though, in hindsight, this is by far the better of the two early singles. Mannschreck's version of 'Where Have All The Good Times Gone', that rare Kinks b-side from 1965, rescued by David Bowie in 1973 on his Pin Ups LP, is surely ripe for rediscovery. Even better is their own composition 'Walking In The Human Mud', again with Lilo on the mic. I'm guessing the subsequent Ou-Wou-Wou and Metromania 12"s were a little more polished sounding. Drop a comment here if you recommend their later work, I'll be sure to check it out, and keep an eye open for future Schreckschuss/ G. Mannschreck related posts. This was a great independent label that even the good folk over at Information Overload have yet to fully document. My favourite underground NDW find of late and a fine example of how us music bloggers work. Thank FM Shades first for this one. I knew nothing about this group until the excellent Nur Für Erwachsene 7" post, which was a response to the style of music posted here. Since then, I've tracked down a rip and upped the full re-issued Umsonst Ohne Risiko collection, partly to return the favour. These reissues were so absurdly limited in quantity that they are now collector's items themselves (all 300 copies of this one sold out quick). So 2003's Nur Für Erwachsene 7" and 2005's Umsonst Ohne Risiko LP can now rightfully be heard both here and at FM Shades. These two were compiled by a fellow record obsessive Franck, founder of the Punk-Disco database, and released on his Was Soll Das Schallplatten reissue label. These gather all the Gorilla Aktiv cassette material released between 1982 and 1983, the two years in which they operated, even including the third demo previously deemed lost. Having done my homework like a good boy, I can now reveal to you, in English, the full Gorilla Aktiv story. Formed in 1982, Gorilla Aktiv (formerly known as Bex and then Fingerfarben) were Tommi Eckart, Nick Deinhardt, and Ian Moorse, an unsigned New Wave trio from Munich. Tommi Eckart was initially a member of Munich punk rockers Alternative Arschlöcher (featuring Lorenz Lorenz), which translates exactly as you thought it might. Once the DIY cassette movement hit its stride in the early 1980s, Tommi teamed up with Nick Deinhardt in 1981 to produce a homemade C-20 cassette of industrial-electronic music under the name Der Kohlenklau. This material can now be found on an LP reissue from 2003, another collectable Was Soll Das Schallplatten re-release. Ian Moorse, the son of film producer George Moorse, was an actor. His roles included a part in Eckhart Schmidt's psychological-horror Der Fan (1982), a cult movie about a girl's obsession and love for a German New Wave pop singer turned nasty! Music-wise, Moorse was initially a member of Lorenz Schröter's Lorenz Lorenz performance group, their most famous piece being '3 Minuten Ei', three minutes of Lorenz screaming 'egg', a performance of which was included in Richard L. Wagner's (Sounds writer) Dreiklangsdimensionen Teil 1 & 2: Dokumentation über die Neue Deutsche Musik, a TV documentary from 1982 for BR (Bavarian television), which allegedly received many viewer complaints. A performance of '3 Minuten Ei' from the Kreuzberg SO 36 venue can be found on the Berlin Super 80 DVD. Lorenz's 'Honecker In Cambodia' can be heard here. Moorse co-wrote Elaste with Lorenz himself, the self-announced 'King of Munich', which was the group's fanzine from the late 1970s. Moorse could later be found jamming with No-Wavers Mauvais Temps, and also writing, with Richard L. Wagner, on the controversial state of the fashion and music scene in Munich in 1982, for Sounds magazine. Here is the original article. 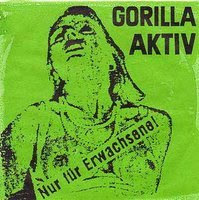 Gorilla Aktiv debuted in 1982 on the underground cassette circuit with a homemade C-10 tape, labeled Die Andere Seite ('The Other Side'), for their own Va Bene fanzine. It featured four songs, reissued as 2003's limited edition Nur Für Erwachsene 7", and now available for download at FM Shades. 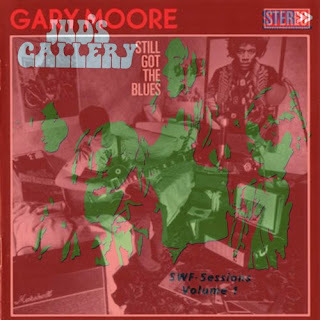 A second tape known only as 12/82 (No Aarhus No.5), was dubbed the following year on a C-20, which sold mainly on the underground cassette market in Denmark. This excellent material is gathered on Franck's wonderful but absurdly limited (in terms of quantity) Umsonst Ohne Risiko LP collection, released last year, including the unreleased third demo tape (scroll down for download). I'm amazed this did not reach vinyl back in the day. Every track here has a real bite and edge to it, and, with a respectful nod to DAF, shows just how well the punk influence lent itself to the electronic New Wave. In 1982, the group were included on Michael Tesch's Spex tape sampler Die Vizeweltmeister ('The Vice-World Champions'), and Lorenz's own München Ist Die Beste Stadt Der Welt! ('Munich Is The Best City In The World!') compilation, featuring the earlier Der Kohlenlau and Mauvais Temps material from the local punk scene. I said I'd post some very cheap vinyl from the NDW underground for a change. There's several decent 7"s and LPs I could choose from that I've picked up for no more than 1 EUR in the past, most of which is major label, so I won't dwell on this too much. Tri Tra Trullala was one of several curiosities I saw posted last year on Matt Woebot's Underground NDW 1980-1983 list of findings. Not sure what to say about Joachim Witt. He released some rather special and some rather not so special music during his lifetime (Der Goldene Reiter still a cult NDW hit), and, of course, very popular for it. So I was pleasantly surprised when I stuck this on. I could be miles out, but is this song about the merits of an industrial solvent called Trichloroethylene that degreases your metals (I am, indeed, miles out on that one, see comments)? If so, it reminds me a little of an equally brilliant British post-punk single by Tea Set, which featured a hand-clapped chorus demanding that the Kodak Tri-X Pan was the very best for producing your panchromatic film black and whites. My love of old school punk 45s leaks into New Wave slightly; you really want this on a 12". And some may think the b-side is a bit run of the mill for this page, and they'd be right, but the chorus is so catchy it'd be a shame to leave it off. This one was apparently engineered at Inner Space by Rene Tinner, Conny Plank's right hand man. New Wave classic! First things first: A big thanks for all this stuff. (in German: hey, lasst das sein, kinder, ihr seid wohl ganz versessen? you are right though about his music. it is pretty strange sometimes, especially his current stuff. but his song "Der Goldene Reiter" is still a cult NDW-anthem (for the more commercially oriented - but I also like it. though this number is better) and he is still around and on German television sometimes. 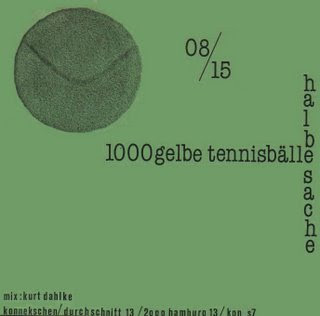 08/15- Tausend Gelbe Tennisbälle KONNEKSCHEN 7" 1980? Thanks to Fred from Sweden for sending me this on CD. I don't fancy coughing up for an original just yet, not at the prices being asked. As for its exact release date, nobody is too sure. I've seen it listed anywhere from 1979 to 1981, and the same goes for the Lorelei 7" by Die Lemminge. What can be said is that this is the work of Andreas Thein, before he joined Propaganda and reworked TG's Discipline, got snapped up by Paul Morley for ZTT and had Dr. Mabuse climbing the UK Top 30 back in 1984. Yes, this is earlier and much stranger stuff, aided by none other than Kurt Dahlke (Pyrolator, Der Plan, Ata Tak etc.) on mixing duties. Thein would soon befriend another Düsseldorf New Wave scenester called Ralf Dörper, found playing in S.Y.P.H. and Die Krupps at the time, to form Propaganda as early as 1982. This one goes out to a awsome new music blog "Mein Walkmen Ist Kaputt" focused on Neue Deutsche Welle aka Underground German New Wave. If you dig No Wave you better check this stuff out, because the germans love their synths mixed with Punk which the american's were always shy of other than groups like the Screamers and Ike Yard. This is a rare single by this bizarre german group from the early 80's. I actually don't know much about them but if you like early Synth Punk/Neue Deutsche Welle you'll love this. They were from Munich and there is a new Lp that just came out of some of their rarities available from WAS SOLL DAS? SCHALLPLATTEN. the A and B sides should of been switched, the b-side kills the a-side on this one. to bad everything i read on this band is written in german, so i apologize for the lack of 'post' on this one. would like to add…im not sure what you would classify this one as, you be the judge. Le bruit de Nyah Fearties comme un mélange du Pogues et de l'Einstürzende Neubauten. C'était la bande secrète de favori du personnel de SPEX il y a environ 20 ans. L'incroyable sain de Nyah Fearties. Ils ont leur propre site Web. 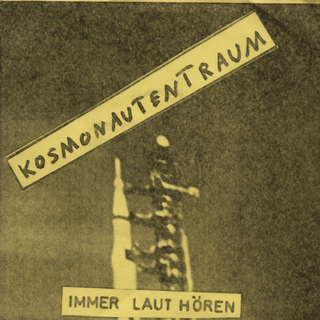 Like with most German punk, due to the language barrier, I don't think I will ever fully 'get' Kosmonautentraum. From what I can hear, they had a strong vocal delivery and political slant, but one to which the music was subordinate to, leaving foreign ears left in the lurch, so to speak. If your German is up to it, try the Livorno 1956 12" on ZickZack, from 1983, a superbly thrashed out and volatile EP, and one that's, just possibly, a strong case for vocalist Ziggy XY (aka Michael Jarick, one time member of Der Moderne Man) as Hanover's industrial answer to Mark Stewart and The Pop Group. A sweet homage to the band can be found here. Going back through the Kosmonautentraum catalogue, and skipping all records in which they perform as the archetypal guitar-bass-drums-vocal four-piece, we end up right at the beginning, with the 'Der Deutsche- Immer Laut Hören' debut, Ziggy XY's self-financed solo EP. Ziggy was writing for several underground Berlin fanzines at the time, and, like Thomas Voburka's Exil-System work (see post below), the 'Der Deutsche' EP was released in accordance with the independent Monogam label. Monogam was partly run by Michael Vogt and Elizabeth Recker (who secretly made the Rainy Day Woman 7"), who both worked in Burkhard Seiler's Zensor shop in Berlin. Zensor was a label and a record store, much like Rough Trade in London, co-owned by Frieder Butzmann. A quick question for my German friends: where was Zensor exactly located in Berlin? Recorded in Ziggy's living room, this 7" apparently didn't go down too well. Even Alfred Hilsberg practicularly called Ziggy an idiot in October's Sounds (the German version of the mag), 1980. This is unlike all other Kosomonautentraum work. Vinyl On Demand re-issued it as part of the 'Unerhörtes Ungehörtes' early works collection last year. Starting very quietly, it builds into a curious examination of the more subtler qualities of noise and electronics, with a threatening air of chaos about it. Bloody experimental. Update: Besprechung des Films in den Kommentaren (allerdings in englischer Sprache). Musik: Der moderne Mann, Hansaplast, Abwärts, Slime, Stromsperre, Boskops, Blitzkrieg, Die Ärzte, Dead Trousers, Der Wahre Heino, Klischee, Abstürzende Brieftauben u.a. Grob geschnitten und montiert wie ein Punk-Video aus den frühen 80er Jahren kommt Addi Fahrenhorsts Dokumentation daher. Fahrenhorst interviewt Punks der ersten Stunde, Jens Franke, Wixxa, Micha von Eye und andere. So nebenbei, am Küchentisch. Oder im Hobbyraum, der wie ein Jugendzimmer mit Punk-Fanzines statt Bravo-Postern tapeziert ist. Wie das alles war, mit dem Punk, der Politik, dem Wave und der Musikindustrie. Bilder aus der Werbung, selbstgedrehte Super-8-Clips und die Stimme von Michael Gorbatschow lassen den Zeitkontext wieder aufscheinen. Überhaupt das alte Material: Das knarzt, knackt und rauscht, der Ton läuft nicht synchron und klingt wie aus einer Blechdose eingespielt. Bei den Videos fehlt die Farbe und wenn sie da ist, wirkt sie überdreht, psychedelisch. Gut erhalten sind eigentlich nur die Super-8-Filme. Sie zeigen Putti und Sprengel, Demos, Hinterhöfe, Kifferküchen, Übungsräume und die Selbstinzenierungen der Punks. Natürlich dürfen auch die Chaostage nicht fehlen. Sie werden kurz und knapp kommentiert von Ute Wieners, zeigen die frühen Auseinandersetzungen mit den Nazi-Glatzen am Bahnhof und die Scharmützel mit der Polizei in der Schaufelder Straße. Doch der größte Teil des Films ist Musik, Konzertmitschnitte von hannoverschen Bands wie Boskops, Klischee, Hansaplast und den Abstürzenden Brieftauben. von Norbert Meissner, D 2008, 15 min. Performances und Kunstaktionen aus der legendären Avantgarde-Galerie ODEM in der hannoverschen Nordstadt. Und hier eine Kritik aus dem Sehnsucht nach Dreck-Blog. 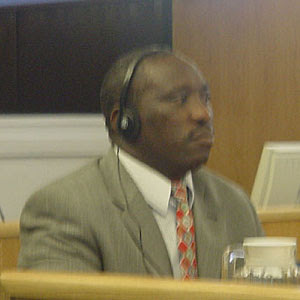 Einer der bekanntesten Sänger Ruanda, Simon Bikindi, ist von UN-Tribunal ICTR in Tansania zu 15 Jahren Haft verurteilt worden für Anstiftung zur Gewalt während der Völkermordes 1994 in Ruanda. Im Urteil wird festgestellt, dass Bikindi von einem LKW mit Lautsprecheranlage herab eine Rede hielt, in der er die Hutus aufrief, Tutsis umzubringen. Das Gericht blieb dabei unter dem Antrag der Staatsanwaltschaft, die lebenslängliche Haft gefordert hatte, denn mehrere Lieder von Bikindi, die damals oft im Radio gespielt wurden, sollen zum Hass auf die Tutsis angestiftet haben. Das Gericht berücksichtigte jedoch, dass die Lieder vor dem Völkermord geschrieben wurden und es keine Belege dafür gäbe, dass Bikinidi sie auch 1994 öffentlich gesungen habe. Ob der "Michael Jackson von Ruanda" gegen das Urteil in Berufung geht konnten seine Anwälte noch nicht sagen. This is Holger Hiller at his most charmingly odd. Two brief minimal tracks for Peter Hein's Weltrekord label (WER04) way back in 1980, before that name was sold to EMI and before Hein set up the bizarre Sneaky Pete Records, where each number for each record was apparently a mate's telephone number or car number plate. 'Sentimental' is written by Hiller and the ex-DAF/ Fehlfarben member Michael Kemner. Incidentally, Fehlfarben's 'Grosse Liebe' maxi-single was the first release for Weltrekord, and is also well worth tracking down. Holger Hiller is most famously known for being the singer with Palais Schaumburg (named after a state government building in Bonn), whose turtlenecks and wonky foot-work was beautifully captured by David Cunningham in this 1982 video. 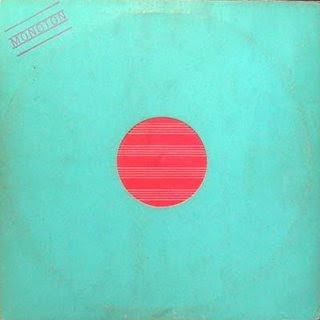 The b-side 'Herzmuskel' is a reworking of the song that can originally be found on Hiller's Ata Tak/ Warning Records single, released earlier in 1980. There is also the Fähnlein Fieselschweif record that Hiller produced, round about the same period, for Luna Park. And what about this video from Hiller's pioneering sample-based 1984 period?